Sorry! Taking a quick break from converting eBooks to multiple formats in favor of the upcoming Black Friday shopping event. Marketing is timing and I thought this would give people enough time to get their Tweet Campaigns ready for the biggest shopping day of the year! GO TEAM! There is no doubt about it! Twitter is a great tool to help market your books by word of mouth. My friend Catherine Bybee SWEARS by Twitter because that's how her books gained recognition. Go check out her Amazon rankings and see how ultra successful she is! I would also recommend you get Kristen Lamb's book Rise of the Machines: Human Authors in a Digital World where she shows authors how to leverage social media as a whole. What I show you here is only a part of what she touches upon in her bestselling book. Secondly, did you have a constant stream of BUY MY BOOK tweets? That can be a sure-fire way to cause many eye-rolling gestures with massive unfollows in your wake or many people ignoring you. It's just annoying, and you'll know what I mean if you watch the Twitter feeds. In this series of articles, I'll not only show you how Tweet a little more personally, but do it more effectively without spending all day at the computer or on your smart phone. You'll be too busy checking your stats! Using Twitter with a genuine flair is the best approach to an organic response. What does that mean for us authors? Be yourself and stop sounding like a ticker-tape stream of adverts. Favorite and inspirational quotes by other authors, public figures or people you admire. Jokes or humorous quotes. People LOVE to laugh and it's a great way to win favor with others. Share information about OTHER authors and help them promote their books by exchanging tweets. And swapping tweets with authors of the same genre is great cross-promotion, too. IDEA: Get a group of authors together to exchange tweets and you can save some time in composing about 50% of those personal filler tweets by promoting your friends using their tweets. OMG! I got an AMAZING #5Star review at #Amazon!! *falls off office chair* http://ow.ly/qNTGh #vampires #witches #werewolves Oh yeah!! I wrote an article about Twitter Hashtags & How To Use Them, where I cover #hashtags and how to leverage Twitter. Be sure to check that post out if some of the above tweets looked strange to you OR if you haven't quite figured out how to use Twitter. In short, a tweet campaign is a stream of tweets you send out over a period of time for a promotional purpose, like a book release day, a free book day, spreading the news for a blog tour stops, or the like. You can do a campaign that spans an hour or even days. “How the HECK am I supposed to do a campaign for DAYS?? My books aren't going to write themselves!” I hear many of you screeching out there. No worries!! Remember, at the beginning of this article when I said you won't have to be sitting at the computer all day? Well, I meant it! I'm a gal who likes to share a good thing, ergo why I have this blog. Now I can say to all my author friends, “Go to this article I posted!” And one great tool I discovered earlier this year (I know…I'm slow) is HOOTSUITE! Hootsuite is a web-based social media interface that allows you to post on various social media networks, like Twitter, Facebook, Google+, LinkedIn, foursquare, WordPress and mixi. AND you can even connect with multiple accounts (e.g., I've connected my Arial Burnz Twitter and Facebook accounts and my Mystical Press Twitter account). Very convenient, as you can literally post one message and have it posted to all those networks with one click! I kid you not! LOVE this tool! There is a free account and a premium account. More on that later. What I like BEST about Hootsuite is you can schedule your tweets (or whatever other messages you'd like to blast). And I don't just mean typing in your tweet, scheduling it on the calendar for a date and time in the future and then rinse and repeat fifty times, like you have to do with TweetDeck. I mean BULK SCHEDULE!! Like up to 350 tweets at once! No joke! More screeches echo across cyberspace. “OMG! Who would send out 350 tweets in a day! ?” Well, very obnoxious people, to be sure. But I am not advocating you do that. That's just how many messages can be queued/scheduled at once in Hootsuite. I can almost hear those wheels turning and tumblers clicking into place. I think you know where I'm going with this. If you spend a little time up front planning and preparing, you can schedule several days' worth of social networking posts – days and even weeks ahead of the event! Hootsuite is free to join and it allows you to set up to 5 social networking accounts. However, there are several wonderful features that are only available to paid, premium subscribers – and the Bulk Scheduler is one of those delightful features. The fee is only $9.99 a month if you pay monthly and you can cancel anytime. $8.99/mo if you pay for the year at once – but that'll be to the tune of just under $108. Ouch! Click here to see what each of their plans has to offer and all the nifty features. 7 Days FREE – Join for free and, when you're ready to use the Bulk Scheduler, they'll tell you it's a premium feature. But at the bottom of the window that pops up, it has a link to try it free for 7 days. I would recommend you plan a couple of campaigns first before you start your 7-day free trial. Note the link UNDER the big, green button! 30 Days FREE – Did you like your 7-day trial? GREAT! After your 7 days are over, you can plan your next few campaigns and then sign up for the premium account. You'll automatically get get the first 30 days for free. You will have to enter a credit card, though, but they won't charge you during that 30-day trial. You cancel anytime before the 30 days is up, so if you can't afford the $9.99 per month…put a reminder on your calendar. If I remember correctly, Hootsuite will send you several e-mails reminding you…but it doesn't hurt to have your own reminder as a back-up. 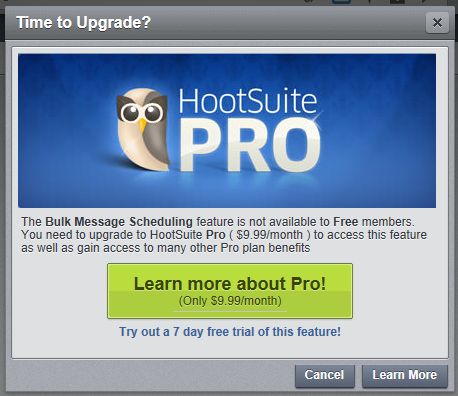 So…visit www.hootsuite.com and sign up for your free account. But don't trigger that 7-day trial until you're ready to do a campaign! Right now, I encourage you to explore and set up your accounts and feeds. Hootsuite has a lot of useful walk-through steps that will show you how to add a social networking account and other functions in the web application. I encourage you to explore everything to see some of the amazing free features and what the premium account has to offer – like click reports, retweet statistics, Google Analytics, Facebook and LinkedIn Insights, Twitter and Facebook Aggregates and more! You can even see all your followers AND who they follow in a single glance by look at your contacts. Obviously, I'm in love with this tool. In the meantime, go create your free Hootsuite account and do some exploring. CLICK HERE to read the next post.